Dear god my mother made these for our “After Christmas” Christmas dinner, and I literally died and went to heaven. 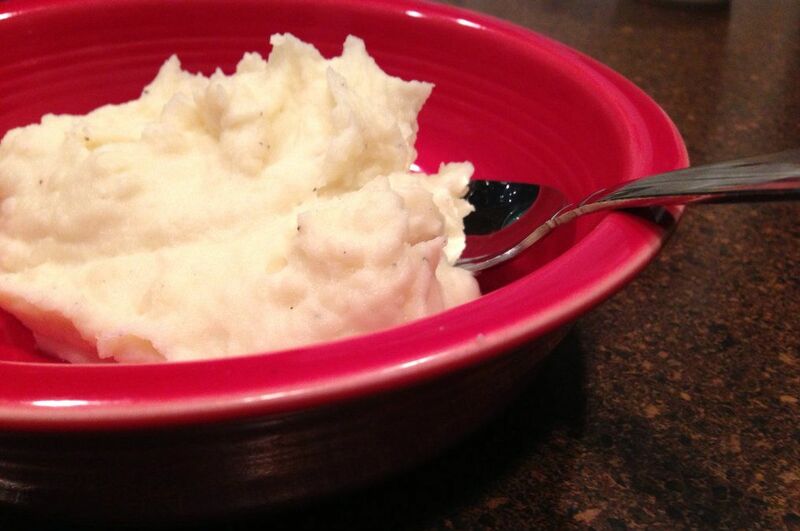 I have never tasted mashed potatoes so good in my life. Even my 2 year old, who has hated any mashed potatoes I’ve ever made (and I make good mashed potatoes), ate and ate and ate these potatoes. They have two secret ingredients – lots and lots of butter and cream cheese! My mother requested they be named for her, so henceforth, these amazing mashed potatoes (which can be made a day ahead of time) will be named Mary’s Cream Cheesy Mashed Potatoes. Also, I usually whip my potatoes, but we used a masher with these and there were NO lumps. Just make sure you cook your potatoes long enough and the lumps will melt away as you mash. Peel and cut up potatoes into fourths. Boil for about 25-30 minutes until they are done. When I can slip a knife through one of the potato pieces like butter, they’re done. Drain the potatoes. Next, mash the heck of them. Slice up an entire stick of butter and add to the potatoes and keep mashing. Next, add an entire 8 oz pkg of cream cheese. We added it in whole and it melted just fine. Next, add the half and half until the potatoes are fluffy. If you’re going to bake these, add enough half and half to make them a teensy bit soupy so they won’t dry out while baking. Add salt and pepper to taste — we probably added about a 1 tsp of both. You can also add Lawry’s Seasoning Salt, but we forgot that step and they still tasted heavenly. Lastly, I think this step is optional because they tasted so good before we put them in oven. Bake at 350 for 15-20 minute. If you make them up a day or so before, take them out of the fridge an hour or two beforehand, then add several pats of butter on top and bake at 350 for 30 minutes. Seriously, if you don’t try these you will never know what heaven is like. These sound delicious, but also sort of like a “heart attack” on a plate…so much butter, cream cheese and then half and half. I shudder at the calorie count. With that said, I’m perfectly willing to add a few cals for good taste and these sound soooo ono!